At the exclusive SOEFEST conference for Tier 1a optimising professionals I had the pleasure of spending some time with a high level Google hygiene engineer who revealed details of a new development that the struggling search engine is hoping to launch this summer! 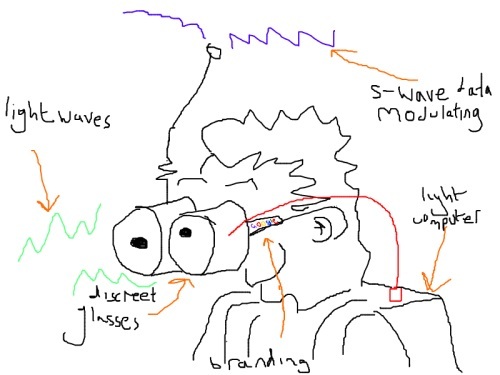 According to the unnamed insider, engineers at Google’s top secret research basement have created a new “find anything” service which will make the search engine portable inside a new device called Google-Oculars. I had a sneaky preview of the device and managed to get some details about how it works. he New Google-Oculars are a lightweight wearable computer which includes a back pack for the battery and processing units, and a pair of lightweight, subtly branded glasses which incorporate a camera and a new nano-Googler (more on this later…). The back pack battery is apparently good for almost 3.5 hours of constant wearing, and the glasses themselves are just 8cm thin, and weigh less than 1 KG on the face! A complicated “data” processing algorithm is used to convert the light waves from the outside world into real computerised information that can be used to help users find things. Google has reportedly developed the ability to identify everyday objects in the real world based on their collection of almost 5,000 different pictures – which are accessible online at the following location: http://www.google.com/imghp. The Google-Oculars combines the data captured using the camera-otimeter with the location data to establish where a user was when they last saw an item, and then uses their RelRank algorithm to measure the importance of the object to the wearer based on their heart rate and other biometric information which is collected constantly. The Nano Googler which has been developed specially for these new devices benefits from vast advancements in technology instigated by Roger Moore. It is very flat – just 0.8mm thin, meaning that it can slide easily through most data pipes. By combining the technology of the new nano-Googler with the Google-Oculars and tracking the various differing pieces of information in near real time, the device is able to track up to 17% of all the things that a wearer does. So what’s all this incredible technology for? As we all know, after wasps, the most irritating thing on the planet is losing important things like Phones or wedding rings. The Google-Oculars have been developed to ensure that users will never lose anything again. By taking a photo every 3 micro seconds, the device can track the instant where “you last had it”, and then feed that information back to the wearer when they need it. According to tests conducted at the Googlingplex in America somewhere, a Google-Ocular wearer was able to locate a mis-placed set of keys in just 7 minutes, using the device, compared to 7 minutes and 17 seconds without – a saving of almost 5%. As an added benefit, if the Google-Oculars are unable to find the object that the user has lost, they can provide useful advertisements for tangentially related services. My unnamed source at Google informed me that the Google-Oculars will be available in time for people’s summer holidays although a price is yet to be confirmed! Some of the high level SOE professionals at the conference talked about how excited they were at the prospect of optimising for the new device, and there was much talk about using the Shatner Bassoon technique to correlate data sources and apply a transceptional algorithm across phase space to subvert the location based technology and provide prefered results in near real time within a standard radius. What’s certain is that this opens a new chapter in the SOE adventure that we’re all a part of! Thanks to my reputation as one of the leading SOE experts in the world, I’m regularly invited to the top secret high level conferences where the latest developments in the industry are revealed. At a recent event at Google’s headquarters I spent time with one of the key nutrition engineers from the struggling search company who spoke openly on the promise of anonymity. Jacob Black is a personable young man who recently joined the company from college, and has risen quickly inside the secretive calorie supply team at Google. We only had a few moments before I was led away from him into a seminar about the upcoming update to Meta Channel Differentials, but what he said chilled me to the bone. Later on, as the attendees of the secret conference hung out with the Googlists and waited for a quick go on the Wii, I noticed that Jacob was right. Despite the fantastic buffet of exotic quiches and appetising tuna paste sandwiches we’d been offered, none of the Googlists were eating. This is unusual in America. As we were ushered out of the building at the end of the evening, there was a nice surprise for everyone. A gift wrapped box. Back at my hotel, I opened the box and found that it contained a brand new mobile telephone. I was struck immediately by its beauty. The large screen looked like a forest pool, and the back of the device sparkled in the fluorescent light of my luxurious hotel suite picking up the faint traces of red neon light from across the street. I sat on the bed transfixed for a few moments, simply holding the device before feeling a chill rattle down my spine. There, across the back of this phone was the word I’d heard from Jacob earlier that evening. Shaken, I put the phone back in its box and pushed it away from me. Seconds later, the payphone I’d used rang. This time it was a man’s voice. “Stop asking questions Mr Garibaldi. The NEXUS project is nothing to do with you.” At the other end of the line, there was a click and then silence. Terrified, I went back to my motel, packed my bags and headed for the airport. The bus passed the backstreet warehouse where the Googlists build their searching robots, but instead of the crowds of people who are normally outside hoping for a glimpse of the Googler, there was no-one to be seen. When I got home from my trip, I was still a little shaken from my experience, and started trying to piece things together. Or rather, I started to take things apart. Using my trusty old Esmee chisel, I pried the sparkly back off my Nexus, and took the parts out. It seemed so simple, all there was inside it was a small version of the internet – a standard feature of modern phones, and a screen. Where the battery normally is though, there was a small, empty glass phial that was connected to a thin pipe leading to the bottom of the phone. Etched in tiny letters across the phial was the name of the manufacturer: Volturi. After putting the phone back together, I was once again struck by how breathtakingly gorgeous it was, and held it for a few minutes. It was cold to the touch though, but I was unable to put it down or stop looking at it. Without warning, it came alive in my hand. The word Nexus appeared on the screen in high definition colour before fading into the traditional iPhone display. I was enchanted by the device. Within seconds I was able to access the portable copy of the internet that the phone contained and enjoy some of the advertising. It was only later that I realised that what I thought had been just a few seconds had actually been more than 3 hours. I felt drained by the time I put the phone down. The next morning there was a knock on my door. Surprisingly, it was Jacob Black from Google. He looked terrified. He handed me an envelope and then without saying anything, walked away. I never saw him again. Inside the envelope was a page torn from a top secret internal book he’d stolen from the Google. My eyes were wide as I read the information he’d given me. It transpired that following the removal of Eric Schmidt from the company, his replacement in the role of manager was an elderly European called Caius, although he goes by Americanised form of his name, Larry Page. Caius had led project NEXUS from the start, developing a new and frightening version of the Google that was designed to understand the thoughts of users so that they no longer needed to use the old fashioned search. Caius had assembled a team of crack data people from around the world who together had been investigating a phenomenon called the Carlisle Principle whereby the thoughts of an individual can be transferred to a computer using haemovectors. Put simply, the team discovered that dismorphic cellular transference rates in the human brain operated on the same federally mandated frequencies as mobile telephones. Provided that the chips in the mobile phones were topped up with a regular supply of iron, they were able to sync with the human haemovectors and amplify them wirelessly to the Google Engine. Problems in the mango subnet systems within the chips meant that the haemo transference vector would only operate correctly for one person, and that without being given access to their blood, it would fail. 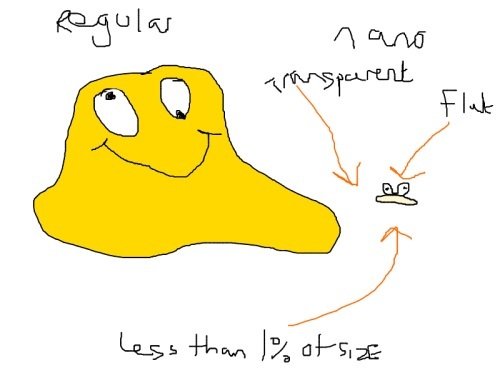 Scientists had managed to isolate the Cullen transmission eigenvector within the duplex narrative in the phone and by connecting it to the chips, it solved the issues that they were facing and led to success. It was only later that the team at Project nexus realised that an uncontrolled shuffle matrix in the Bellanet had led to problems in the wider system. The Nexus mobile telephones were taking more and more blood from their users, and using a multiplication pyramid cortex to spread the increasing volume of data across the cellular network. The impact of Google-s Nexus Project were wider than anticipated. Direct exposure to the darkest thoughts of individual users as they looked for things on the webs, The Googler became more and more aggressive in its quest for data, and began gobbling up more and more web pages, and transformed into what the internal team call the Voogler – a vampire Googler. 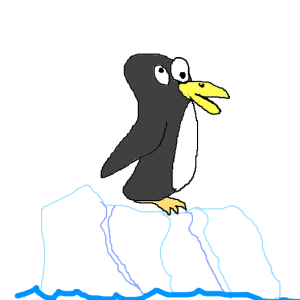 According to the internal memo from Google, it appears that many of the changes that the SOE community have been debating recently – Google Penguin for example – have been developed to sate the appetite of the Googler as it guzzles down increased numbers of haemovectors that have been isolated from the blood of Nexus users via the Volturi transference principle that replaces the battery in the devices. Ever since we revealed existence of the portable internet in January 2010, web owners and so called SOE experts around the world have been struggling to try and understand the best ways of getting a number one in it. With more people now carrying a portable copy of the internet in their pocket or on their telephone than watching the internet on their television, portable SOE is now more important than ever. 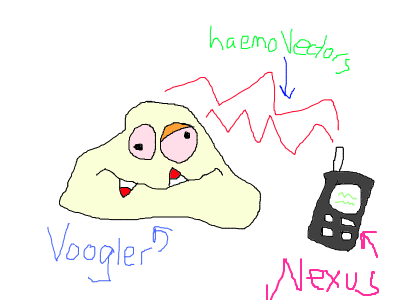 During a recent conversation with a highly ranked member of the Google hierarchy at a top secret invitation only conference for level 12 SOE professionals, I came into some priceless informations that will blow the world of the portable internets wide open, and for the first time allow even ordinary webbers to get their own webbing onto people’s phones. Although it is still people who will be reading your internet on go, they are different to the kind of person who uses the internets at home. All text on the portable internet requires a +4 modification to the caveatic vortex within the latent semantic eigenvector mapping structure in order to make sense. This has been written about extensively elsewhere and is a technique that all SOE professionals will be completely comfortable with applying. The portable Googler uses a different polynomial distribution in its crawling subroutines to allow for the doppler matrix changes that come from it’s distributed code base. Essentially, although your portable edition contains all 6,000+ pages of the full internet, they are only updated to the latest version on a Tuesday at midnight, at which time the portable Googler will start to explore the new versions of pages and assign new ranking scores for them. A normal web has a full matrix of informational sub structures inherent within the underlying codes, and these can be updated manually by the internet managers once an hour. Obviously this is not possible unless your portable internet is connected to the mains, and you need to reflect this in your server settings so that when the internet upload function is enabled, all pages get changed at the same time. You can disable the standard doppler matrix of your web by setting the server permissions for your portable website to 888 rather than the normal settings. This will feed an abandonment subroutine via the main internet control room and reverse the polarity of the neutron flow instantly. In order to make up for the linguistic modification allowances outlined above, it is important for professional webbers to add images to the portable version of their pages. The oft cited rule for images is that an image is worth a thousand words, and this is adhered to 100% by Google – with a slight modification based on their skyscraper algorithm. To calculate the correct number of images for your portable page, simply add the integer value of 7.5 times the difference in word count between your full page and your portable page divided by pi to the number of images used on your full page. If you have exactly 200 words on your proper internet, and 50 words on your portable version, then the number of images required to make up the difference in the content differential value is 358%, which means you need 4 more images than you would normally. For convenience on smaller devices, you should always shrink image size by the same 0.25 shrinking factor that you use for the page as a whole. 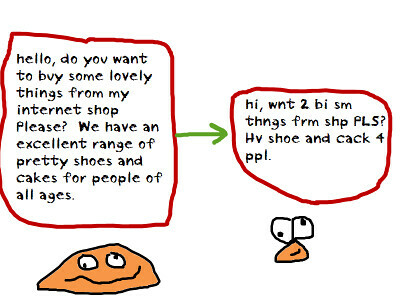 this can be done using a professional image editing programme such as Microsoft Paint. 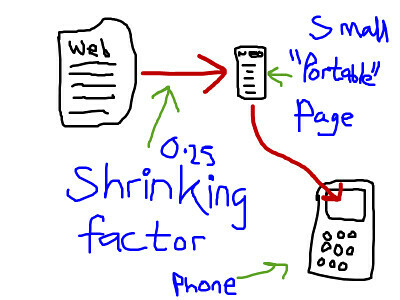 Getting your website ready for the portable internet age doesn’t need to be a challenge for SOE professionals, and can be achieved easily using the techniques above. Pandas are the hottest trend in SOE right now, and pretty much every SOE expert has been looking at ways to get one for their sites. Sites that have been given a panda by Google are rumored to get a +5 bonus on their Pageranking, and a 0.5 addition to their relevancy score for all searches. Google have been really secretive about how ordinary web owners can get their own panda bonus, but despite the rarity of a Google Panda, savvy webbers have managed to come up with some sure fire ways of getting one quickly. In the wild, pandas are said to be voracious eaters, spending up to 20 hours a day gorging on whatever snacks they can find, and Google’s robot pandas are thought to be very similar – except instead of swinging through the trees gobbling jungle chips like real pandas, they read up to 10 average size websites a minute eating words. Google’s pandas use a technology called a content vector to find interesting web pages. The more pages that they can find, the stronger the content vectors become, and the more the panda is attracted to the page. If you have enough pages in your web, you will be able to bait a panda and take full advantage. Real panda’s get bored fast, and are known as nature’s tarts because they spend so much of their time running around and getting into romantic scrapes. Google’s mechanical pandas are a bit like that, and if they get bored they have a tendency to run away and find someone else. Once a Googling panda has arrived in your web, you need to keep it for as long as possible. The panda will only stay for as long as it has something to read, so it is really important to keep it interested. Some tests have suggested that a Googler Panda needs as much as 10,000 words a day or it gets bored and starts to cheat on you with a competitors website. Pandas might be quite flighty creatures in real life, but according to rumours I’ve heard from deep inside the real Googleplex, each Google Panda uses military grade cognitive semantics and becomes exclusively fixated on a subject. The more similar you can make the pages in your web without making them exactly the same, the more easy it is to trap the panda inside your web and continue to get the benefit of him on your rankings. Good luck with your pandas. O’Mera MPs locks the door behind him and steps into the street in a pristine white suit. Newsagent. Fresh copy. Blank codes. I see the major and step into a shop. Shopping list. No need for assistance. Exit. Check the train times. Read the news in McDaids. The Barrelhead complains over the rain. London to Manchester Piccadilly. A gorgonzola sandwich. Crumbs. B’fhearr liom uisce beatha. 87 Euros. Jones set to leave. Train’s on time. Delivery address. Back into the street. A busker sings “Poor Paddy on the Railway”. No one’s listening to those who drop out of view. Following rumours that the ever growing artificial intelligence of the Googler had caused the internet robot to become mad with power, and faced by ongoing protests about lack of personal freedom, and demands for greater democracy on the Internets, it appears that Google has finally admitted defeat, and is set to cede control over the world’s information to the general population. According to a well placed source within the secretive inner circle of advisors at Google, the president of the popular not-for-profit company has decided to embrace democracy and abandon their plans to use robots to enslave the world’s population. by the will of the people, we, the leaders of Google hereby grant full democratic rights to the world. Off the record, my source suggested that many within the powerful inner circle had wanted to avoid full democracy, but growing fear that the recently upgraded Googler would enslave the whole world led to a swift capitulation within the ranks. Although it wasn’t immediately clear what form this democracy would take, within hours, internet loving boffins within Google’s secretive engineering team released details of a voting system that would allow people of the world to decide what websites were good or bad. The once powerful Googler has had it’s strength down graded by 30% as it now only needs to count votes, rather than calculate keyword density and check that the Meta Rank tag had been used. What this means for the 250 SOE professionals worldwide is not yet clear, but it is thought that unless there is some way in which voting could be manipulated, many SOE experts are likely to find themselves out of work.